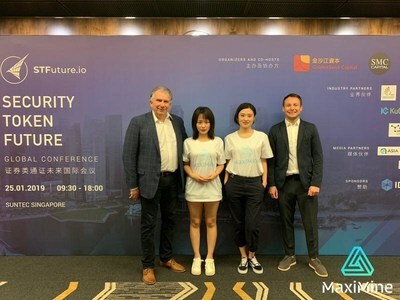 SINGAPORE, Jan. 30, 2019 /PRNewswire/ -- Cloud-based pool mining platform MaxiMine brought the roof down last Friday at the long-awaited Singapore edition of the Security Token Future Global Conference hosted at the Suntec Singapore Convention & Exhibition Centre. As one of the main sponsors of the star-studded event, MaxiMine stood front and centre and drew incontestable attention with its vibrant booth and charming mascots. Graced by heavyweights Gibraltar Stock Exchange (GSX), RHT Taylor Wessing, the GITA Foundation Council, TALENTA and honoured by prominent blockchain media Thetokenist and Ampliv amongst others, the global conference was a largely successful affair hosting a diverse profile of individuals and a turnout brimming beyond the original 300 seats it was intended for. The day-long lineup encompassed a thoughtful blend of keynote speeches by important individuals in both the blockchain and traditional trading space, with the most notable ones including deliveries by GSX CEO Nick Cowan and GITA Co-founder Mik Mironov. Whilst the event officially concluded at 6pm, networking buzz continued trailing after; a sure sign that the Security Token Future Global Conference is one that has made its mark as an unforgettable affair in the STO space this 2019.